The final round of games in Group F fell into an awkward not-quite-dead-rubber area. Wins over Bosnia & Herzegovina and Iran secured Argentinian qualification, while a win over the Bosnians had made Nigeria the most likely to join them. They could do with some kind of result against the favourites to make sure, but Iran were unlikely to get anything against Bosnia & Herzegovina so in truth the game didn’t matter all too much. 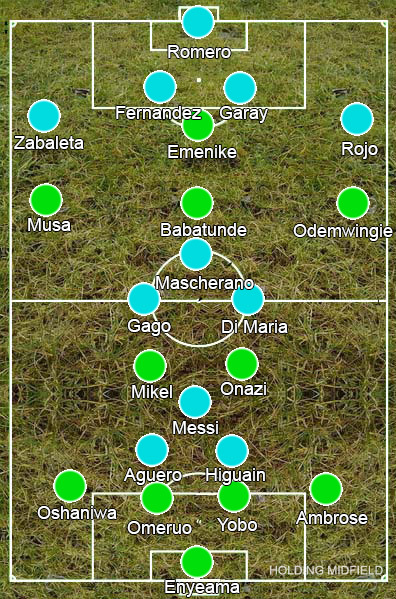 Neither team made any changes, Alejandro Sabella continuing with the 4-3-1-2 and Stephen Keshi with his 4-2-3-1. Both teams scored before the game settled into any pattern, but both of the goals showcased the only real tactical elements of note. Nigeria’s holding duo did a good job of keeping Lionel Messi relatively quiet throughout the match, with Ogenyi Onazi keeping particularly close to him, but this meant Angel di Maria was able to venture forward with little attention being paid to him. The opener came from Di Maria creeping forward and cannoning a shot back off the post, with Messi on hand to score from the rebound. There may be something to say about Javier Mascherano being free to pick out his pass, yet it was a fantastic first-time ball – his diagonal passes have never got the credit they deserve – that Nigeria most likely wouldn’t have been able to stop anyway. Fernando Gago was also much more effective here than he had been against Iran, mostly because he was now given space to work in with the Nigerian midfield occupied by Messi. Ahmed Musa equalised immediately. The left-winger had the measure of Pablo Zabaleta throughout the game and twice managed to escape him to grab a brace. The narrowness of Argentina means their full-backs have a massive workload to both defend and attack, and breaking quickly can catch them out easily. They rely heavily on Mascherano to stop these attacks but if he’s caught elsewhere, they are found wanting. Argentina’s other two goals came from set-pieces and Nigeria won’t feel unhappy with their performance. It’s unlikely they will have to deal with any single player as talented as Messi again in the tournament, and their counter-attacking gameplan will work better against less focussed teams. It may worry Argentina how much they rely on him for goals and Mascherano to defend however.